It has been interesting to watch the progression of Dog and Human over the last several hundred years. For hundreds of years humans have bred dogs to have specific drives, personalities and temperament to match the job required. In the last few decades it has become more popular to rescue dogs from all different mixes, personalities, temperaments and drives. Intended Job – What job do you need the dog to do? Temperament / Drive / Personality – Determine what would be the best temperament, drive and personality for that job. Breed Selectively – Take dogs with traits close to what you are looking for and breed them together until you achieve the desired natural temperament, drive and personality. Training is a piece of cake – Since they are naturally suited for this job they quite often require little to no training. What looks pretty? – Choose a dog based on what looks cute. This can be through a breeder or a rescue. Find out what natural temperament, drive and personality they have after they have been acquired. Try to have the natural temperament, drive and personality trained out of the dog. Essentially we are trying to fight Mother Nature’s Natural Recipe. I am not sure what caused the shift from purpose to looks. I don’t know why a dog that wins breeding shows achieves higher prices than a dog that was bred properly for health and a specific job or task. Another interesting change is the thought people have on rescuing a dog. You quite often hear people say “Why would I buy a dog from a breeder when there are so many rescue dogs looking for a home?” I can understand getting a rescue but I am not too sure about that statement. First a person would have to ask themselves “Why are there so many dogs that need to be rescued?” To me it seems there has been a lot of excessive breeding which can constitute poor breeding or mismatched homes for the dogs bred. If you have ever talked to a responsible breeder, this is what you will find: They have a list of people looking for a dog. They then screen those people to ensure they are the right match for that breed of dog. If they are not the right match then they do not receive a dog. The breeder then breeds accordingly to the supply required. So in essence if a person wants to get a rescue and not support breeding it seems as though they are only supporting the irresponsible breeders as those dogs get surrendered or they breed beyond their supply requirements. The responsible breeders carefully select forever homes for these dogs and have “no breeding contracts” signed so these dogs are not allowed to be bred. They also have in the contract that if circumstances change the dog comes back to the breeder and they find another properly matched home. I do find it very difficult to find a responsible breeder as more seem to be in it for the wrong reason than the right reason. In my opinion the right reason is breeding a dog for the family requirements which is generally these days a pet. If you want an example of a responsible breeder you should check out http://www.starstrucklabradors.com They are even approved by the Calgary Humane Society. The reason I find these changes interesting is that it causes so many people a lot of grief, stress, frustration, money and sometimes ends relationships. If the order was switched back around to first and foremost choosing the job required of the dog and then selecting the dog from there it would make things go much more smoothly. We decided what kind of dog we wanted as a pet. We wanted a nice temperament and eager to please dog that we can take camping or on trips with us. We then searched for a breeder that was responsible. We went to check out the puppies and we chose one that had a nice bond with us that wasn’t clawing all over us. They had a nice easy temperament. We then wanted to ensure that dog was trained properly so we researched trainers and came across your website. We really agreed with your philosophies and loved the video on your website and thought we want our dog to be like that. Here we are, ready to do the learning and the training. We want to spend time with our dog and ensure they are well trained. I tell these people to tell everyone they know how they chose their dog. Tell them that a dog trainer who works with the worst of the worst for dog behavioural problems wants you to spread the word to as many people as possible on how to properly choose a dog. You guys nailed this 100%. There are rescue dogs that can also be temperament tested. This is a bit harder as you don’t know what the parents were like. The other big issue if you are getting an older dog is to not know what their past experiences were like and what they have been socialized to. Properly socializing a puppy is an extremely important process to success with training. Here is a common list of problems we deal with. They are so common that my wife can list what the problem is when a client phones and I can guess what the breed of dog is. Border Collie – Chases anything with wheels and tries to bite tires or herd children or other dogs. Rottweiler / Cane Corso / Mastiff – Too protective and won’t let people in the house or may try to lunge at people if they are too close on a walk. Husky – Pulls on leash and is too hyper. Pitbull – Aggressive with other dogs and is too hyper. The list is quite long but that will give you some ideas. These are all traits that have been bred into these dogs (some breeders have bred traits out of them so that is why it is important to know what the breeder breeds for). Choose a dog based on the order it has been done in for hundreds of years and you will be happy. Choose a dog based on the wrong order and you can be setting yourself up for a whole lot of grief. I am a big fan of nature. I love animals and I love watching their interactions. We just had a funny occurrence here between one of our chickens and one of our dogs. 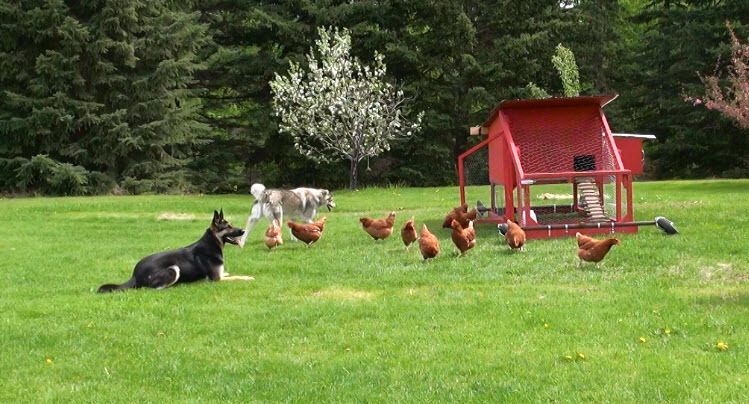 Chickens, just like dogs have a Pack Mentality. Chickens have a “Pecking Order” (that is where the term Pecking Order comes from if you didn’t already know this). At mass produced chicken barns they clip the beaks off the end of the chickens. This is to ensure that they do not kill too many other chickens. When you have 10 chickens, the lowest ranking chicken may get pecked by 9 other chickens. When you have 10,000 chickens then they may get pecked by 9, 999 other chickens. Once a wound is opened up on a chicken the other chickens will continue to peck at that wound until the chicken is dead. I do love watching how animals that were never meant to be in a Pack together can then become pack members and not view each other as predator and prey. All animals as far as I know seem to have a hierarchy. 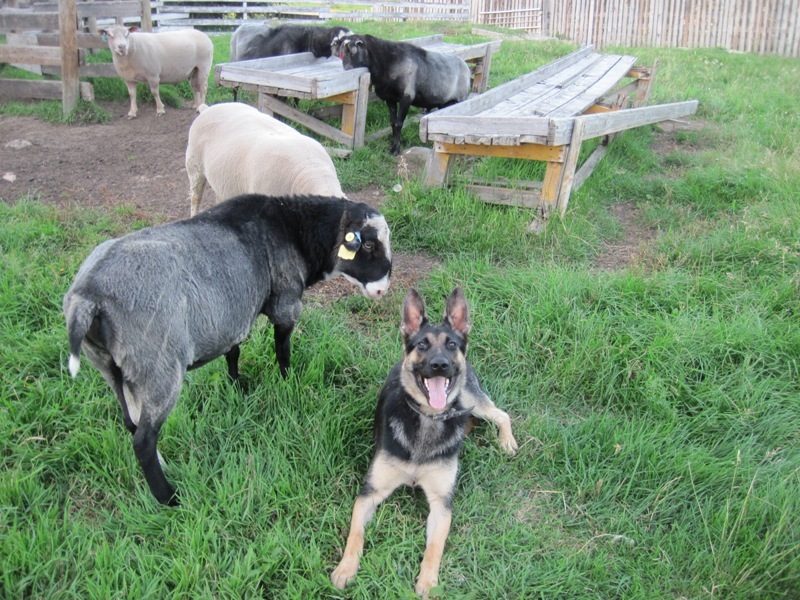 When it comes to training dogs if you are not seen as the Alpha Dog then you will get no where with training. 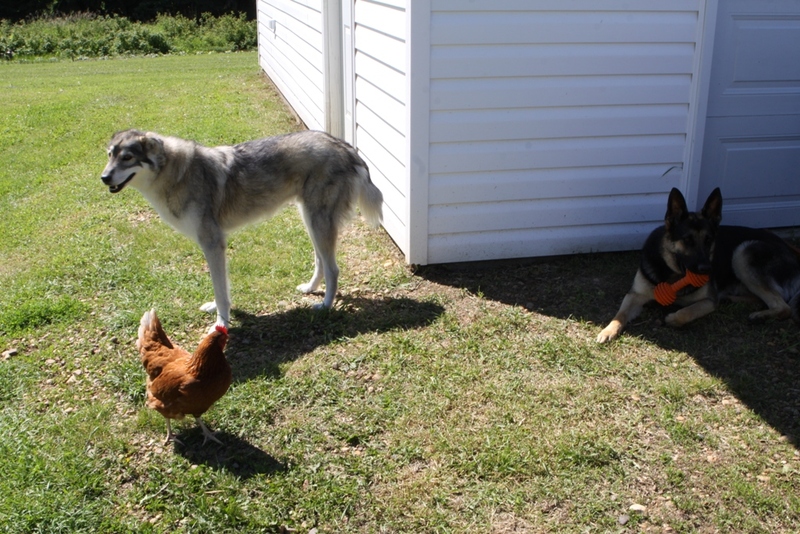 The only reason our dogs get along with chickens is that all of us have agreed that I am boss. Whatever the boss says, goes. Many people have tremendous difficulty training their dog because they do not provide clear leadership and rules. It is common to think that spoiling a dog will make them happy. This I find to be very untrue. The more you make a dog work and provide them with clear leadership the happier they are. You will also have a lot more peace within your Pack. I would also like to take this time to remember our chicken Ginger who passed away recently. Ginger was a very sweet and calm tempered chicken. We miss you Ginger and will never forget you. Pack Structure in Place – Dogs that know their position in the Pack do much better with children. Spoiling dogs leads to the biggest chance of bites and aggression toward children. Having a dog work and understand their rules goes a long way towards being good with children. It can be very difficult for a dog to view children as higher ranking and respect them. By following Pack Structure rules you really help to ensure success. Fetch – Delta loves fetch so we will play fetch while the little girl is present. Find your ball – Delta loves to find her ball in the house so we would play that game with the little girl running around. Tracking – We had the little girl and her mother go and hide on our property and off our property with Delta’s favorite ball. Delta loves to track after we taught her how to last summer. Delta found them in short order and her ball was tossed to her. No Petting – Many people think you have to have the child pet the dog. This is one of the biggest chances for a dog to bite a child. All that you have to do to socialize a dog to a small child is play their favorite games next to the child. Delta was walking right passed the little girl playing games. The little girl could reach out and touch her but this was not necessary at all. This whole petting idea to socialize a dog can create a lot of problems. When Delta was a puppy we would play a CD with the sounds of children playing while we played a game with Delta. I would also take Delta around schools and daycares on the opposite side of the fence just slightly away from the children playing and I would play games with Delta there and work on obedience. I would also do things to Delta that a child likely would not do. I would practice playing a game and pull on her ears or her tail or legs. I would grab a handful of hair and pull a bit. We would also put Delta onto her back and wait for her to calm. I would hold her upside down and also cradle her like a baby. We proof a dog up for all of these things just in case a child does something to the dog it is not a surprise to that dog. However I always closely monitor dogs and children. If I cannot then we keep them separated. Dogs can easily bite children. Some dogs are naturally good and some are naturally not good with children. The higher the pain tolerance a dog has the better they generally are with children. If a child grabs a handful of hair it won’t hurt a dog with a high pain tolerance. If you do this to a dog with low pain tolerance it can hurt the dog a lot which can elicit a bite. Dogs that bite children are often put down. In almost all of these cases proper prevention and socialization can ensure harmony between dogs and children. If you have a puppy or dog that you want to be excellent with children, give us a call. We would be more than happy to show you the proper techniques.